WHITE RIVER STATE PARK. 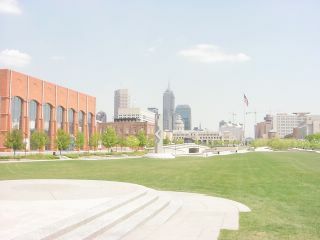 Another urban public space in downtown Indianapolis that was a stroke of genius: White River State Park. It ties together Victory Field, the canal, the Indianapolis Zoo, Indiana University Purdue University at Indianapolis (IUPUI), three museums, the National Medal of Honor memorial, and the NCAA center. Lots of green space and paved paths, all bordering White River. Indy's own version of the National Mall?